Meniscal tears are displayed in the images below. Coronal fat-saturated proton density–weighted image shows the popliteus recess containing joint fluid and located between the lateral aspect of the posterior horn of the lateral meniscus and the joint capsule. An extensive tear is present in the posterior horn of the medial meniscus (arrow). Note the normal oblique upward orientation of the posterior medial horn of the lateral meniscus. Coronal fat-saturated proton density–weighted image shows the popliteus tendon originating from an undulation of the lateral femoral condyle. From there, it passes through the popliteus recess to insert on the proximal posterior tibial metaphysis. A radial tear (arrow) is present in the posterior horn of the medial meniscus. Sagittal fat-saturated proton density–weighted image shows a full-thickness tear to the periphery of the anterior horn of the medial meniscus (MM). Tears in this location have a good likelihood of healing without surgical repair because they occur in the zone with a good blood supply to the meniscus. Also present is a partial thickness tear to the undersurface of the posterior horn of the MM. Coronal fat-saturated proton density–weighted image shows irregularity to the upper (femoral) surface of the body of the lateral meniscus (LM, outer arrow), indicating fraying. Fraying usually occurs at the meniscal apex. Soft tissue densities (inner arrow) are present under the apex of the meniscus, indicating debris or a free meniscal fragment at this level. The body of the LM is unusually thick and longer than usual, indicating a discoid meniscus. The normal-sized medial meniscal body is present for comparison. Discoid menisci occur about 5 times more often here than in the LM, and they are more prone to injury. Axial illustration of a full-thickness longitudinal tear of the posterior horn. The meniscus is viewed from above in (a), sagittal in (b), and coronal in (c). 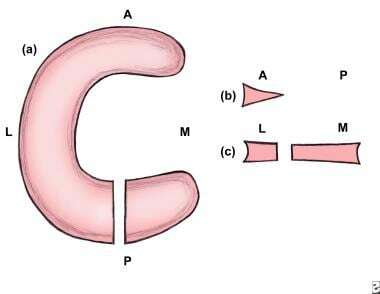 For Image 67-70, A = anterior, L = lateral, M = medial, and P = posterior. Axial illustration of a full-thickness radial tear of the posterior horn. The meniscus is viewed from above. Axial illustration of a full-thickness horizontal tear of the posterior horn. The meniscus is viewed from above. 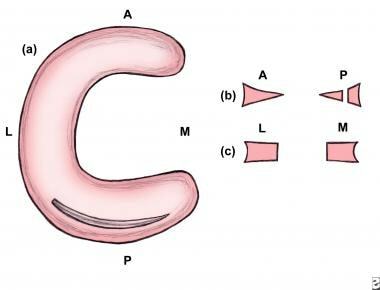 Axial illustration of an oblique (parrot beak) tear of the posterior horn. The meniscus is viewed from above. In B, image 1 is most lateral, image 2 is middle, and image 3 is most medial. In C, image 1 is most anterior, image 2 is middle, and image 3 is most posterior. Plain radiography is extremely limited in the assessment of meniscal tears. Radiographs may be obtained to rule out unsuspected lesions, such as osteochondritis desiccans and loose bodies. In the presence of a discoid meniscus (DM), radiographs may show widening of the medial or lateral joint compartments; hypoplasia of the lateral femoral condyle related to the increased size of the LM; a high fibular head; cupping of the lateral tibial plateau; or a squared-off lateral femoral condyle. 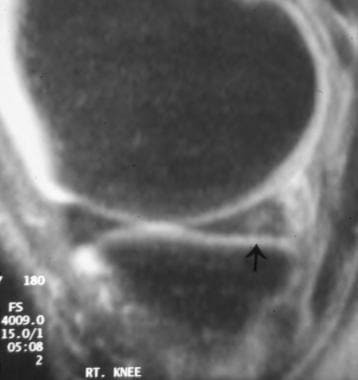 Coronal fat-saturated proton density–weighted image shows abnormal signal intensity in the posterior horn of the medial meniscus (MM) extending to the undersurface near the junction with the joint capsule. Such tears may be missed on arthroscopy because that part of the knee joint is difficult to access. Also present is a tear to the posterior medial horn of the lateral meniscus (LM) as it slopes obliquely inward. A false-positive diagnosis of meniscal tear can be made when one evaluates this region because of the magic angle effect. Tears persist when the echo time (TE) is varied and when T2-weighted images are obtained. True tears can also be confirmed by visualizing them on sagittal or axial projections. Sagittal fat-saturated proton density–weighted image of the lateral compartment shows the relative equal size of the anterior and posterior horns of the lateral meniscus. The meniscal body has the normal configuration of a bow tie. Sagittal fat-saturated proton density–weighted image of the medial compartment shows the larger posterior horn (arrowhead) and the smaller anterior horn. 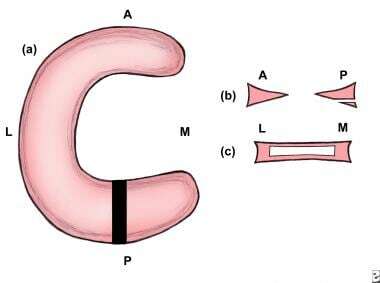 Peripherally (medially for the medial meniscus [MM] and laterally for the lateral meniscus [LM]), the menisci have a bow-tie configuration, as shown in the images below. The anterior and posterior horns are taller than the thinner and interposed body of the meniscus. Sagittal fat-saturated proton density–weighted image demonstrates the concave superior meniscal surface (arrows), which improves contact with the femoral epicondyles, and a flat undersurface, which improves contact with the tibial plateau. The periphery (outer edges) is thicker than the central portion (arrowhead), allowing for firm attachment to the joint capsule. Note the normal bow-tie appearance of the meniscal body. Sagittal fat-saturated proton density–weighted image shows the inferior fascicle. In this location, the superior fascicle is not present. Note the normal bow-tie appearance of the meniscal body. Coronal proton density–weighted image shows extensive grade 2 signal intensity in the anterior and posterior horns of the medial meniscus. However, the signal intensity does not extend to a joint surface. Sagittal proton density–weighted image shows the tibial insertion site of the posterior horn of the medial meniscus (MM). The popliteus tendon and its accompanying sheath course through the posterolateral portion of the posterior horn of the LM in an oblique anterosuperior to posteroinferior direction. It is seen on the more lateral images of the LM (see the images below). Coronal proton density–weighted image shows the ligament of Wrisberg originating from the posterior medial horn of the medial meniscus and passing obliquely upwards (arrow) to attach to the posterolateral aspect of the medial femoral epicondyle. Two fascicles connect the posterior horn of the LM at the popliteus tendon sheath level to the joint capsule. The inferior fascicle is seen on the more lateral images through the tendon. Here, the superior fascicle is absent. More medially, both superior and inferior fascicles are present. The most medical images through the tendon show the superior fascicle and absence of the inferior fascicle. The thickness of the popliteus tendon sheath varies in size from a thin line to a thick band. Coronal fat-saturated proton density–weighted image of the mid knee shows the normal appearance of the body of the medial and lateral menisci. The apices (inner portions) are the thinnest part of the meniscus and are more central in the knee joint. The periphery, meniscal bases, outer portion (arrow and arrowhead) is the thickest part and contains the blood vessels supplying the meniscus. Coronal fat-saturated proton density–weighted image shows the relative size of the posterior horns of the medial and lateral menisci. The posterior horn of the medial meniscus (left arrow) is thicker than the posterior horn of the lateral meniscus (right arrow). Note the normal dark appearance (relative lack of signal intensity) in the menisci. The medial portion of the posterior horn of the lateral meniscus (ie, the meniscus on top of the fibula) is directed upward obliquely, from a lateral to medial direction. This is its normal course. Coronal fat-saturated proton density–weighted image shows the dark appearing popliteus tendon (arrows) passing through the popliteus recess. The posterior medial horn of the lateral meniscus is directed obliquely upward. Coronal fat-saturated proton density–weighted image of the posterior portion of the knee joint. 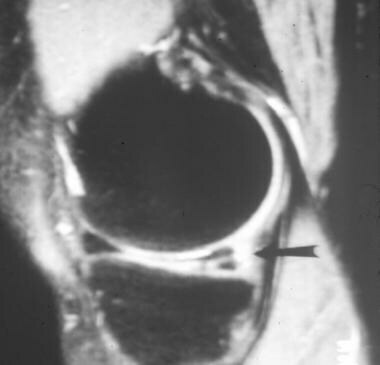 A circular, fluid-filled structure (arrow) is present in the upper portion of the most medial portion of the posterior horn of the medial meniscus; it represents a meniscal cyst. The insertion of the semimembranosus tendon is located posterior along the subarticular surface of the medial aspect of the proximal tibial metaphysis (see the images below). This is not to be confused with a displaced meniscal fragment. 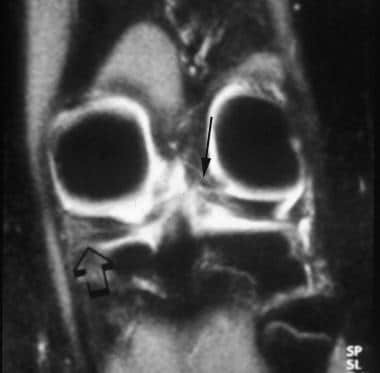 Sagittal fat-saturated proton density–weighted image of the posterior knee compartment shows the normal insertion (arrow) of the semimembranosus tendon. The insertion site is near the posterior horn of the medial meniscus (MM), and it is not to be mistaken for a displaced meniscal fragment. Sagittal fat-saturated proton density–weighted image of the paramedian portion of the lateral joint compartment. The transverse intermeniscal ligament (arrowhead) is about to unite with the anterior horn of the medial meniscus (MM, arrow). Fat is normally present in this region and can mimic a ligament or meniscal tear. By carefully following the course of the ligament on sequential images and by observing a uniformly well-defined, hypointense structure on every image, this pitfall can be avoided. A small, ill-defined, linear soft tissue density is present under the anterior horn. It is separated from the anterior horn by bright fluid. This is a rare tear in this region. The brightness is joint fluid in the tear. The menisci are attached to the central portion of the tibial plateau by fibers originating from the anterior and posterior horns, the meniscal roots. The anterior root of the medial meniscus has the largest footprint of all the meniscal roots. It inserts broadly into the anterior intracondylar crest. The anterior root of the lateral meniscus inserts on a smaller area posterior in relation to or on a portion of the anterior intracondylar crest in front of the lateral tibial tubercle and lateral to the tibial insertion of the ACL, with which it partially blends. The posterior root inserts on a small portion of the posterior slope of the medial tibial tubercle, which is posterior to the insertion of the posterior root of the lateral meniscus. Most of the posterior root inserts on the horizontal part of the posterior intracondylar area but some of the fibers attach to the posterior slope of the lateral tubercle and along the intertubercular longitudinal crest that connects the medial and lateral tibial tubercles. A meniscal flounce is an uncommon meniscal variant characterized by a single symmetrical fold along the free edge of the meniscus. 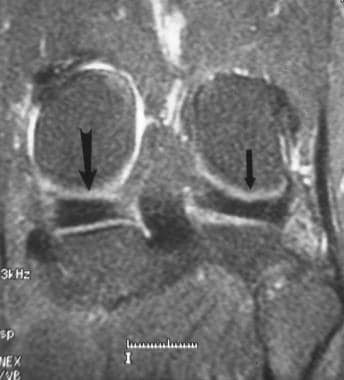 It appears as an S -shaped fold along the free edge on sagittal images and is associated with a truncated but normal meniscus on coronal images. The normal meniscus shows uniform, low signal intensity on T1- and T2-weighted images obtained with both conventional and fast-spin echo (FSE) sequences. The low signal is related to a lack of mobile protons in the meniscal fibrocartilage. Subsequent dephasing of hydrogen nuclei results in T2 shortening, contributing to the low signal intensity on all pulse sequences. Differentiation between a true discoid meniscus (DM) and a slightly larger but normal meniscus may be difficult. On coronal views, the abnormal meniscal body extends more medially toward the intercondylar notch (see the image below). The posteromedial horn of the MM and the anterior horn of the MM near the roots may have a normal speckled appearance (see the images below). Sagittal fat-saturated proton density–weighted image of the paramedian portion of the medial knee. The transverse intermeniscal ligament is about to insert on the anterior horn of the medial meniscus (MM). The anterior horn is normally speckled. The anterior horn is partially displaced off the anterior surface of the tibia by a radial tear more laterally (picture is not shown). 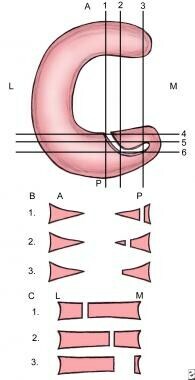 A tear involves the posterior horn of the MM (arrow). Sagittal fat-saturated proton density-weighted image shows a well-defined, soft tissue density in front of the posterior cruciate ligament (PCL). It is speckled and looks like the normal posterior medial horn of the medial meniscus (MM), but it is in the wrong place. This finding represents a displaced meniscal tear involving the posterior medial horn. The position of the meniscus is referred to as a double PCL because it looks like 2 of these ligaments are present. Coronal images show the smallest width of the meniscal body, making this plane the most sensitive for showing meniscal enlargement. 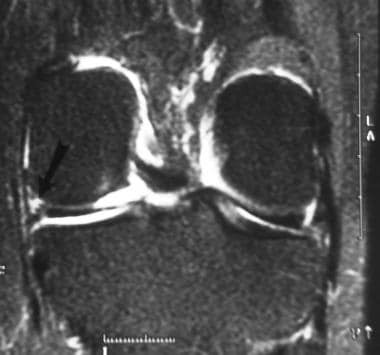 An asymmetric DM with an enlarged body may have a wide meniscal body on coronal images but normal anterior and posterior horns on sagittal images, emphasizing the need for coronal images. Incomplete DM may not extend into the intercondylar notch. In children, grade 2 signal is frequently seen within the posterior meniscal horns. This is thought to represent normal vasculature, seen in the meniscus of a child. This disappears in adulthood. Both menisci are additionally stabilized by the transverse ligament. If any of these supporting ligaments or the meniscus itself degenerates or is torn, the meniscus may become unstable. The knee is usually positioned in extension with slight external rotation to facilitate imaging the anterior cruciate ligament (ACL). A review of 6 studies, including the author's, showed a distinct discrepancy between the sensitivities of FSE and conventional spin-echo sequences. The sensitivities of fast spin-echo techniques for detecting a meniscal tear was approximately 80% whereas the sensitivities for conventional spin-echo sequences averaged approximately 90%. The authors postulated that abnormal meniscal signal may appear to extend to the meniscal surface secondary to blurring and may be incorrectly interpreted as a tear. Grade 1 is a nonarticular, focal or diffuse region of increased signal intensity within the substance of the meniscus (see the image below). This finding is correlated with early meniscal degeneration and chondrocyte-deficient or hypocellular region. The terms mucinous, myxoid, and hyaline degeneration are used interchangeably to describe the production and accumulation of an increased amount of mucopolysaccharide ground substance in stressed areas of the fibrocartilage of the meniscus. Such changes are a response to repetitive mechanical loading. This appearance is found in healthy volunteers and asymptomatic athletes and not clinically significant. Grade 2 is a horizontal, linear area of increased signal intensity within the substance of the meniscus that extends to but does not involve the inferior surface (see the image below). Such regions of abnormal signal are more extensive than in grade 1 degeneration, and no distinct cleavage plane or tear is present. Grade 2 is a continuation of progressive degeneration from grade 1 changes. Patients are usually asymptomatic. Sagittal fat-saturated proton density–weighted image shows abnormal signal intensity in the posterior horn of the medial meniscus, which appears to extend close to the inferior surface. This represents grade 2C changes in signal intensity. It can be difficult to differentiate grade 2 and grade 3 changes. Injuries causing grade 2C signal intensity can progress to degenerative tears. Grade 2 signal may be of 3 types. Type 2A is a linear signal not in contact with an articular surface. Grade 2B is abnormal signal in contact with an articular surface on only a single image. Grade 2C is an extensive wedged-shaped signal abnormality not in contact with an articular surface. Histologically, there is microscopic collagen fragmentation and clefting within the hypercellular region of the fibrocartilaginous matrix. The middle perforating collagen bundle, which divides the meniscus into superior and inferior halves, is the site of preferential accumulation of mucinous ground substance. It also represents the shear plane of the meniscus and is also the site of origin of horizontal degenerative meniscal tears. The posterior horn of the MM is the most common location. It also is the most common site for grade 3 meniscal tears. The presence of grade 2 signal-intensity changes is not predictive of future progression to grade 3 meniscal tears. Grade 2 represents a point of potential structured weakening. Grade 3 tears, when they develop, are adjacent to or are in continuity with areas of grade 2 changes. Grade 2C is a subcategory in which linear signal intensity extends to the articular surface on a single image. When found in symptomatic patients, about 50% have a tear. There are no additional features that can discriminate a torn meniscus from an intact meniscus with grade 2C signal intensity. Grade 3 is a region of abnormal signal intensity within the meniscus extending to and communicating with at least 1 articular surface of the meniscus. Multiple foci of grade 3 signal-intensity changes may be present in 1 meniscus. Although most meniscal tears are well seen on PD-weighted images, they are not visualized as well on T2-weighted images, unless there is a wide cleft at the site of the meniscal tear that freely communicates with joint fluid. If such a situation is present, confidence in diagnosing a meniscal tear is high. However, this finding is not common. Criterion 2 is an abnormal meniscal shape. Comprehensive knowledge of the normal MRI anatomy of the menisci is required. Meniscal tears are more confidently diagnosed when they are seen on both sagittal and coronal images. The presence of a meniscal tear on both these views decreases the rate of false-positive diagnoses. However, some tears at the meniscocapsular junction can be seen only on 1 of these views. Meniscal tears occur in 2 primary planes: vertical and horizontal. The 3 basic meniscal tear shapes are longitudinal, radial, and horizontal. Meniscal tears are either partial thickness or full thickness. Longitudinal tears separate the meniscus into inner and outer fragments and occur parallel to the outer margin of the meniscus (perpendicular to the tibial plateau and propagate parallel to the circumferential axis of the meniscus). These tears are equidistant from the outer (peripheral) meniscal margin throughout their entire course. Longitudinal tears are more commonly traumatic in etiology and occur in younger and more physically active patients. They are also commonly found in patients who have also acutely torn their ACL. Such meniscal tears are located in the posterior horn of the LM, central to the popliteus tendon. In addition, these tears do not involve the free-edge (the inner part) of the meniscus on any image. They are often located in the middle or outer third of the meniscus and usually begin in the posterior horn. A partial-thickness longitudinal tear contacts only the superior or inferior articular meniscal surface, but not both. Short tears, or those confined to the posterior horn, may be visible only on sagittal images. Longer tears propagate into the body of the meniscus. These are seen on both sagittal and coronal images. 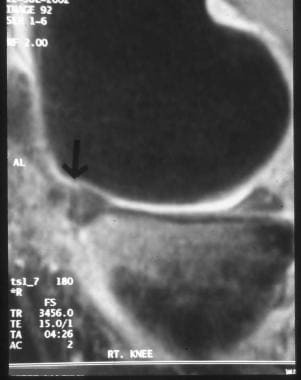 Coronal proton density–weighted image shows a full-thickness, vertical bucket handle tear (arrow) through the base of the medial meniscus (MM). Sagittal proton density–weighted image shows a vertical bucket handle tear (arrow) through the periphery of the posterior horn of the medial meniscus (MM). Tears in this location do not usually heal spontaneously because this portion of the meniscus lacks blood supply. 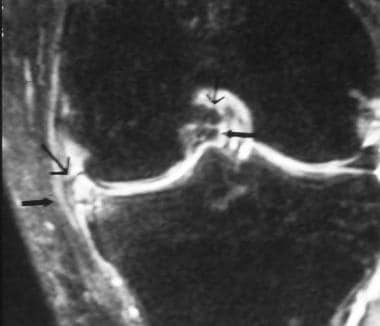 An absent bow-tie sign is helpful for diagnosis of bucket handle tears of the meniscal body (see the image below). The normal body of the meniscus is 9-12 mm in width and should be seen on 2 consecutive sagittal images and, as described in normal MRI anatomy, has the shape of a bow tie. When a bucket handle tear is present, part of the free edge of the meniscus is missing. The inner portion of the meniscal body will be absent. Confirmation almost always occurs in the form of a displaced meniscal fragment that is visualized elsewhere in the knee joint. Sagittal proton density-weighted image of the outer portion of the lateral side of the knee shows an absence of the body of the lateral meniscus (LM, arrow). The body of the meniscus should be visualized peripherally. The normal appearance of the meniscus has the appearance of a bow tie; the bow tie is absent here. 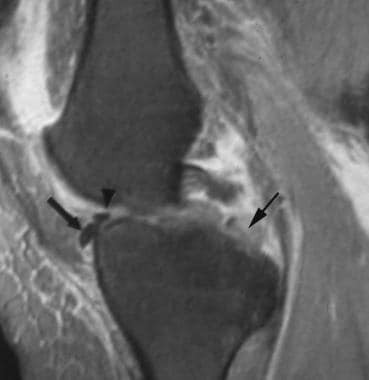 When no displaced fragments are found, an absent bow-tie sign may be related to a normal but small meniscus. In this situation, both the medial and LM are small; bucket handle tears of both the medial and LM, occurring at the same time, are rare. 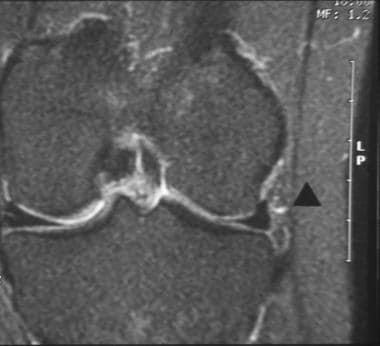 Another cause of an absent bow-tie sign is a normal postoperative meniscus in patients who have undergone PM. These injuries may be further classified as single, vertical longitudinal tears, displaced bucket-handle tears, broken bucket-handle tears, and double and triple vertical longitudinal bucket-handle tears. They are 3 times more frequent in the MM when compared with the LM and may be associated with ACL tears. Bucket-handle tears are commonly seen in young adults with a history of locking, extension block, or slipping of the joint due to displacement of the central fragment toward the intercondylar notch. Radial tears are vertical tears and propagate perpendicular to the main axis of the meniscus. These injuries are devastating because a full thickness tear destroys meniscal integrity, ie, the ability of the meniscus to distribute hoop stress. Hoop stress is the normal outward force generated in the meniscus in all directions as a result of weight bearing. The force is distributed in the meniscus by collagen fibers, located around the circumference of the meniscus from apex to periphery. The collagen preserves the normal shape and integrity of the meniscus in weight bearing. Radial tears transect these fibers. The meniscus is normally attached to the tibia at the anterior and posterior ends. During weight bearing, the meniscocapsular attachments pull the meniscus outward. A radial tear occurring between the tibial attachment points causes the free, unattached edges of the meniscus at the point of the tear to temporarily pull outward, expanding the width of the tear, exposing a bare spot on the adjacent tibia and femur, allowing abnormal stresses on the unprotected articular cartilage and bony surfaces, and resulting in articular cartilage destruction and subsequent bone alteration, leading to accelerated degenerative disease. Small tears may be difficult to recognize on MRIs. Missed radial tears constitute a large proportion of errors made in image interpretation of meniscal pathology. The key feature of recognition is that they involve the free edge of the meniscus. Thus, the inner point of the meniscal triangle is absent or blunted on 1 or more images. Radial tears of the meniscal body are best seen on sagittal images. They disrupt the normal bow-tie configuration of the meniscus on 1 or more images. Like longitudinal tears, radial tears are commonly traumatic and occur in younger, more physically active patients. Tears in the MM usually occur in the posterior horn and are more common in older patients. Small tears of 3 mm or shorter may be asymptomatic. Tears located near the posterior horn of the LM are associated with ACL tears. They may be associated with more complex meniscal tears, such as vertical longitudinal tears or peripheral horizontal cleavage tears. They are devastating because the circumferential fibers are disrupted. The meniscus is prevented from developing the necessary hoop stress that normally helps dissipate forces across the knee. It is common to see a radial tear as one component of a complex tear. A high prevalence of radial tears is present in postoperative patients who have had partial meniscectomy. Magee et al indicated a 32% prevalence when viewing 100 postoperative MRIs. This may be related to altered biomechanics of knee function after partial meniscus removal. Stresses may be redistributed that predispose to radial tears. Although horizontal tears may appear to extend deep into the meniscal substance on MRIs, the tears, as seen at arthroscopy, may extend only a few millimeters into the meniscus from the point where the abnormal signal contacts the meniscal surface. When it extends to the periphery of the meniscus, the cleft between the fragments can allow the egress of joint fluid to the meniscosynovial border, where it may become trapped, forming a meniscal cyst. Most are degenerative, occurring in older patients with osteoarthritis. Sagittal proton density–weighted image of the mid portion of the medial compartment shows a full-thickness horizontal tear of the posterior horn of the medial meniscus extending from the base to the superior surface. In addition, image shows amputation of the inferior apex of the posterior horn. The combination of these 2 tears involving the same part of the meniscus makes this injury a complex tear. The tibial plateau articular cartilage normally completely covers the posterior horn of the menisci. If fluid is located beneath the meniscus, especially the posterior horn, detachment should be considered. This is called a floating meniscus. These menisci are usually intact without evidence of tear. Arthroscopy requires infusion of saline into the joint. This may relocate a displaced but otherwise normal meniscus into normal alignment. It is imperative the orthopedist be alerted to the presence of this entity to avoid the pitfall of misdiagnosis. 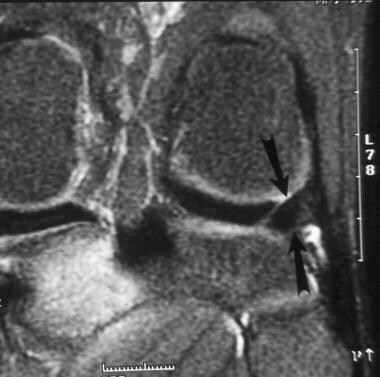 Coronal fat-saturated proton density-weighted image shows speckled displaced meniscal fragment (inner arrows). Also present is an extensive horizontal tear to the body of the medial meniscus (MM) with a lot of hyperintensity at the periphery (outer arrows). This represents a meniscal cyst. Repair of the cyst without repair of the underlying meniscal tear results in recurrence of the cyst. Bucket-handle tears are the most common pattern, occurring in 10% of meniscal tears. They result from vertical, longitudinal, or oblique tears. These tears often involve the entire meniscus but isolated tears of the anterior horn, posterior horn, or (more commonly) the posterior horn and body. A flap tear is a short-segment horizontal meniscal tear with either superior or inferior displacement of the meniscal fragment. This type is less frequent; superior displacement is more common. Inferomedial displaced tears from the MM are uncommon. When the displaced fragment extends inferior and medial to the tibial plateau, deep to the MCL, it may go unnoticed by the arthroscopist because the meniscus surface may appear intact. Sagittal fat-saturated proton density–weighted image shows soft tissue (arrows) lying on top of the anterior horn of the medial meniscus (MM), separated from it by high signal intensity (bright joint fluid). This finding represents a displaced meniscal fragment. The posterior horn of the MM is abnormally shaped and has abnormal signal intensity. This is the origin of the displaced fragment. The height of the combination of the displaced fragment and the anterior meniscus is greater than 8 mm. The height of the meniscal tissue equal to or greater than this number is a good sign of a displaced meniscal fragment. 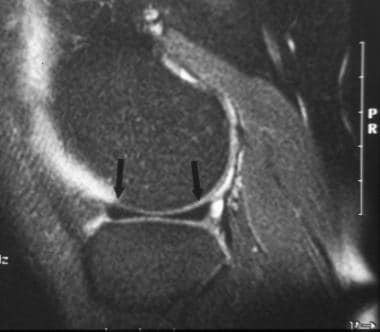 Pseudohypertrophy of the anterior horn of a meniscus occurs when an anterior meniscal horn appears abnormally large. The meniscal body or posterior horn is unusually small. This indicates a portion of the torn body or posterior horn has flipped anteriorly and lies behind the anterior horn. The abnormal meniscal fragment and the adjacent normal meniscus are separated by joint fluid, which has increased signal intensity on T2-weighted images. The differential diagnosis includes the following: ligament of Humphry, loose bodies, osteophytes, and fracture fragments. The stability of tears is determined by a number of factors, including the length, location, and completeness of the tear. Probing the meniscal tear during arthroscopy is critical for determining stability. A stable vertical longitudinal tear occurs when the central (inner) fragment of a meniscal tear cannot be displaced more than 3 mm from the intact meniscal periphery. Any meniscal tear with a displaced fragment is unstable. Longitudinal tears that are relatively long are unstable; their length is assessed on multiple 3- to 4-mm sections in either plane, and they extend through the full thickness of the meniscus or contain fluid on T2-weighted images. Some meniscal tears do not show a free fragment at the time of MRI. Whenever, however, the inner margin of the tear can be displaced to a position where it can be entrapped between the rotating femur and tibia when probed at arthroscopy, it is considered an unstable tear. The cause of the abnormal signal might be related to blood products from a compressive injury to the vascular zone of the meniscus that track along the meniscal fibers, resulting in increased signal. Meniscocapsular separation (MCS) is a tear of the periphery of the meniscus at the meniscosynovial junction. The attachment of the MM is more commonly involved due to its firmer contact with the joint capsule. The site more frequently involved is the capsular attachment of the posterior horn of the MM at the tibia, at the meniscotibial (coronary) ligament. MCS is frequently associated with ligamentous injuries about the knee. They rarely propagate into the meniscal periphery, though they can be an extension of a full-thickness tear. Spontaneous healing is common because of the rich blood supply in the meniscal periphery. First, reports indicating a lateral compartment preference were written before the use of MRI. MRI is more sensitive than PE in the detection of small meniscal cysts. There is a relatively scant amount of fatty soft tissue on the lateral aspect of the knee compared with the medial aspect. This may explain why more lateral cysts were reported because, in that region, cysts are more apt to appear as a palpable mass. Second, other diagnostic methods, such as knee arthrography, lead to underestimations of the true incidence of meniscal cysts. Diagnosing meniscal cysts with arthrography requires the extravasation of contrast material through the meniscal tear and cyst, but this does not always happen. Third, meniscal cysts are occasionally overlooked at arthroscopy because visualization of the posterior horn of the MM can be difficult. Thus, cysts in the posterior medial compartment were underdiagnosed. LM cysts are most commonly located adjacent to the anterior horn or body. MM cysts are twice as common as LM cysts, and MM tears are twice as common as LM tears. The tears are most commonly formed when horizontal tears extend to the meniscal periphery, allowing joint fluid to escape into the parameniscal soft tissue. The fluid subsequently encapsulates and becomes symptomatic due to mass effect. Occasionally, the cyst can be confined to the meniscus. This is referred to as an intrameniscal cyst. It is important to recognize the association between meniscal cysts and meniscal tears. If the cyst is resected without addressing the tear, the cyst may recur. 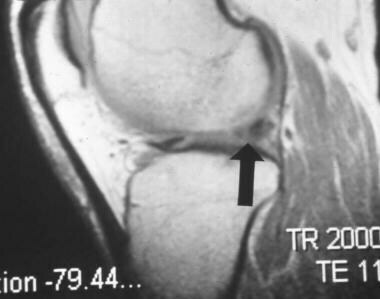 The MRI appearance is a fluid-filled region adjacent to a horizontal meniscal tear. Meniscal ossicles are rare and often mistaken for intra-articular loose bodies. Chondrocalcinosis is calcification of the menisci, synovium, and/or articular cartilage due to the deposition of calcium pyrophosphate dihydrate crystals, dicalcium phosphate dihydrate, calcium hydroxyapatite, or any combination of these crystals. The condition is seen in conditions such as gout, degenerative disease, hemochromatosis, crystal deposition disease, and hypercalcemia. These intra-articular crystals are weakly positive fringent monourate crystals under polarized light. The prevalence is 5-14% and increases with age. A multitude of conditions and mechanisms are implicated in the pathogenesis. Meniscal tears eliminate the hoop stress of the meniscus. Sustained compressive forces within the knee can cause displacement or extrusion. After meniscal extrusion, the unimpaired impaction of cartilage leads to osteoarthritis. Fast spin echo (FSE) images are less sensitive than conventional spin-echo images for diagnosing meniscal tears, even when the imaging parameters are optimized. Two prospective studies in a large number of menisci examined with FSE imaging showed a sensitivity of 83% for meniscal tears; this is lower than most studies using conventional spin-echo techniques. With 3D fast MRI, there is 95% concurrence between MRI and arthroscopy in detecting meniscal tears and 100% concurrence for detecting meniscal degeneration. MRI is accurate for predicting repairable meniscal tears and sensitive for determining nonrepairable tears. One study showed 89% (103 of 116) of meniscal tears were categorized the same at MRI and arthroscopy with respect to repairable vs nonrepairable groups. The same study, however, showed that MRI had a variable accuracy for predicting meniscal tear configuration found at arthroscopy. Most of the findings involve vertical or horizontal degenerative tears in the posterior horn. There has been a gradual decrease in the number of false-positive diagnoses as a result of better recognition of normal anatomy and postsurgical variations and improved arthroscopic techniques. Most of these results are in the outer half of the posterior horn or the inner third of the meniscal body. Two thirds of these tears are small, stable, and treated conservatively. Like the LM, most are not diagnosed directly at arthroscopy; rather, the diagnosis is made on the basis of the behavior of the meniscus to probing or compression. Causes include the following: (1) chondrocalcinosis in the meniscus mimicking a tear and (2) healed meniscal tears that often continue to show increased signal intensity that contacts a meniscal surface. Regarding limitations in the criterion standard, ie, arthroscopy, most MM tears present on MRIs but not identified at arthroscopy. These tears occur on the undersurface of the posterior horn. This location is an arthroscopic blind spot. Although additional viewing portals and angled arthroscopies may be used, there are still some areas of the MM that cannot be visualized. False-positive findings include vertical, degenerative oblique, horizontal, and meniscocapsular tears. Justice and Quinn reported that 20% of false-positive tears were described as frayed on arthroscopy and not frankly torn, as seen on MRIs. Intra-articular loose bodies, which can obscure the meniscal margins and mimic a tear. Causes of variation between the accuracy rate of MRI and arthroscopy in diagnosing meniscal tears are varied. Radiologists have different learning curves for interpreting knee MRIs, and arthroscopists have different levels of experience. Cassells has noted that "some surgeons learn arthroscopy slowly or not at all, and some are not very capable in this (diagnostic arthroscopy) respect." The accuracy of arthroscopy in diagnosing meniscal tears has been reported to be between 68-98%, depending on the experience of the examiner and the location of the tear. Nonetheless, surgeons generally regard arthroscopy as a standard of reference. Differences in descriptive terminology concerning meniscal damage are another factor. To one arthroscopist, a free-edge abnormality may be described as fraying and, to a radiologist, the same abnormality may be diagnosed as a small tear. Different types of MRI equipment, surface coils, and field strengths cause variability. Arthroscopy may not detect intrasubstance degenerative cleavage tears. The medial femoral condyle might interfere with arthroscopic visualization of the posterior horn of the MM. The periphery of the meniscus at the meniscocapsular junction is difficult to image on MRIs. Most false-positive MRI findings occur in the posterior horns of both menisci. These regions are acknowledged to be the most difficult for arthroscopists to examine. The validity of the assumption that arthroscopy is the most reliable method for assessing the outer third of the posterior horns and the inner third of the body of both menisci has been questioned. The inferior surface of the MM and, to a lesser extent, of the LM, cannot be routinely seen arthroscopically. The negative predictive value (NPV) provides an estimate of the patient's likelihood of having no meniscal tear at arthroscopy when MRI indicates no tear. NPV is 100% for the MM and 91% for the LM. Because of the high NPV, a negative MRI can be useful to exclude patients from unnecessary arthroscopy. The prevalence of meniscal tears in asymptomatic patients increases with age. One study showed an incidence of 13% in patients younger than 35 years and 36% in patients older than 45 years. The sensitivity of MRI in detecting displaced meniscal tears depends on the size of the displaced meniscal fragment. When less than one third of the meniscus is torn, the displaced fragment will most likely not be seen on MRIs. Conversely, when the displaced fragment involves more than two thirds of the meniscus, it will be identified. Isointensity in the meniscus relative to fluid on T2-weighted MRIs, has a sensitivity of 60% and specificity of 92% for diagnosing new or recurrent meniscal tears. The accuracy of MR arthrography in diagnosing recurrent meniscal tears is 88%; that of routine MRI is 66%. The greater the amount of meniscus removed, the higher the accuracy of MR arthrography and the lower the accuracy of routine MRI. Regarding reasons for decreased sensitivity with MRI, there is a different distribution of meniscal tears between knees with intact and torn ACLs. With ACL tears, meniscal tears are often in the periphery of the posterior horn of the LM. This is a difficult region to evaluate arthroscopically. Fortunately, meniscal tears in this region do not often require surgical treatment. Finding a severe injury like an ACL tear may distract the radiologist from identifying more subtle, but equally important meniscal injuries. Subluxation of the knee from combined ligament tears may result in unusual anatomic appearance of the menisci, distorting their appearance, making recognition of meniscal tears more difficult. Patients with more severe injuries, such as concomitant ACL tears and meniscal tears, are less likely to remain motionless during MRI examinations because of pain. Patient motion results in poorer diagnostic images. For DM tears, MRI does not have a high PPV for diagnosing meniscal tears (57%) when the standard criterion of abnormal meniscal shape is applied. Short TEs needed for meniscal imaging may result in artificially increased signal intensity in the meniscus because of the magic-angle phenomenon. This is most common in the posterior medial horn of the LM where the main magnetic field (b0) is orientated along the head-to-foot axis of the patient (typical for most superconducting, high field-strength systems). The normal posterior horn of the lateral meniscus (LM) slopes obliquely upward from lateral to medial, as it ascends from the lateral tibial plateau to its insertion on the posterior tibial eminence. On coronal images, it often achieves an angle of 55° relative to the long axis of the leg. This is the angle where the magic-angle phenomenon occurs when short TEs are used. This orientation leads to shortening of the apparent T1 relaxation time, resulting in an increase in signal intensity within the posterior horn, which may simulate a tear or grade 2 signal-intensity change. This finding can be differentiated from true meniscal tears by increasing the TE; magic-angle findings disappear. True meniscal tears remain visualized. This finding can also be eliminated by imaging the knee in slight abduction, which alters the orientation of the posterior horn of the LM in relation to Bo. Any change in the normal meniscal shape, in the absence of prior surgery, indicates a tear, with 2 exceptions: (1) the DM, and (2) buckling of the MM producing a wavy appearance. This is similar to a phenomenon called meniscal flounce seen occasionally during arthroscopy. This last finding is normal. Entities that may mimic meniscal tears include the origin of the meniscofemoral ligaments from the posterior horn of the LM, the popliteus tendon passing next to the posterior-lateral corner of the LM, and the attachment points of the intermeniscal ligament to the anterior meniscal horns. These errors can be avoided by following the anatomic structures on subsequent images. The obliquely orientated meniscomeniscal ligament may be confused with a meniscal fragment in the intercondylar notch region. Careful attention to axial and coronal images will avoid this pitfall. Regarding grade 2 versus grade 3 signal-intensity change in the meniscus, determining whether the signal intensity in the meniscus extends to the articular surface can be difficult. Evaluating for any change in the morphology of the meniscus at this site may be helpful. If the meniscus is distorted or abnormally shaped, the signal intensity is likely grade 3. The transverse intermeniscal ligament and surrounding fat is another mimic. In 30% of cases, the fat surrounding the transverse intermeniscal ligament may mimic a meniscal tear. On sagittal images, the ligament crosses between the tibial attachment of the ACL and the Hoffa infrapatellar fat pad. Axial 3D Fourier-transformed sections of 1 mm or thinner may demonstrate the normal course of the ligament if a meniscal tear is still uncertain after standard MRI. Tears of the anterior horn of the LM are rare. The central anterior ligamentous attachment of the anterior horn of the LM is rhomboid and normally directed upward on sagittal images. It frequently contains increased internal signal intensity. On serial sagittal images, the ligament may be traced from the anterior horn of the LM to the anterior horn of the MM. A prominent vessel from the lateral geniculate artery rarely produces a pseudotear adjacent to the anterior horn of the LM. The lateral inferior geniculate artery, arising from the popliteal artery at the level of the knee joint, courses anteriorly around the lateral aspect of the knee and participates in the rich collateral circulation in this area. It is closely applied to the LM through its course. It lies within a region of periarticular fat between the meniscus and the LCL. When the artery lies adjacent to the anterior horn of the LM, it can appear as a tear on sagittal images. The artery can be traced on adjacent sagittal images so as not to be confused with a tear. It may be difficult to differentiate between meniscal fraying and meniscal tearing. The semimembranosus tendon can be mistaken for a displaced meniscus (see the image below). The popliteus tendon sheath may be mistaken for a tear in the posterior horn of the LM. True tears of the periphery of the LM in this region usually have a different orientation than that of the tendon sheath. When in doubt, this structure can be traced on subsequent sagittal images and normalcy can be confirmed by using PD- and T2-weighted axial images. A vertical tear of the posterior horn of the LM may, however, parallel the popliteus tendon sheath. Here, the popliteus tendon must be used as a landmark to find the peripheral edge of the meniscus. After lateral meniscectomy, the low-signal popliteus tendon may be mistaken for a retained posterior horn meniscal remnant. The normal concave edge of the periphery of the meniscus may demonstrate grade 2 signal on peripheral sagittal images through the body of the meniscus. This is more commonly seen in the MM and is caused by partial volume averaging of fat and the neurovascular structures in the soft tissues adjacent to the concavity of the meniscus. This is seen in up to 20% of MMs and 6% of LMs. Thin-section coronal images show a normal meniscus and its normal concave margin. The meniscal insertion of the meniscofemoral ligament may mimic a vertical tear through the posterior horn of the LM. This appearance is caused by the interposition of fat between the ligament and its meniscal attachment. The fat signal intensity disappears on fat-suppressed images. This pseudotear extends obliquely from the superior meniscal surface and is directed posteroinferiorly toward the inferior meniscal surface. The pseudotear less commonly appears as a vertical line parallel with the meniscal periphery. Vacuum phenomena cause magnetic susceptibility artifacts. Intra-articular gas can normally occur when traction is applied to the joint. Gas, normally present in tissues, comes out of solution as a result of reduced pressure. This leads to magnetic susceptibility artifacts, which appear as low signal intensity on T1-weighted MRIs or as a blooming artifact on GRE images. This gas may be mistaken for a meniscal tear. Gas collecting in the medial joint space between the articular cartilage of the femur and tibia can appear as a triangular signal void that simulates meniscal tears or an abnormal volume of meniscal tissue resembling a DM, or a displaced torn meniscal fragment. Magnetic susceptibility is the ratio of the intensity of magnetization of the applied magnetic field. Bone, air, gas, and ferromagnetic materials have a susceptibility markedly different from that of soft tissue. Ferromagnetic materials have the greatest difference; bone, air, and gas have a lower difference. Artifacts occur when there is a great and abrupt difference between the magnetic susceptibility of adjacent tissues. Such differences are caused by inhomogeneities in the magnetic field resulting from intrinsic magnetic field gradients generated in such a region. These gradients result in the misregistration of spatial information in the frequency encoding direction because pixel information is associated with the wrong frequency. The result is areas of artifactually high and low signal intensity. Truncation artifacts are lines that traverse the menisci that can be confused with tears and are problematic when a 128 X 128 matrix is used with a 128 phase-encoded axis orientated in the superior to inferior direction. Truncation artifacts result from the use of Fourier transformation methods used to construct MRIs of high-contrast boundaries, such as the interface between the articular cartilage and the meniscus. When an attempt to recreate the boundary is made, an inaccurate representation is produced. The image exhibits a series of overshoots and undershoots (a sine-integral function), occurring in alternate pixels as one moves away from the boundary. This appears as lines of increased or decreased signal intensity. The size of the artifact is the difference between the degree of over- and undershooting. Such a line of high signal within the low signal of the meniscus may mimic a tear. One manifestation is the ringing artifact (Gibbs phenomenon), which occurs near highly contrasting interfaces. 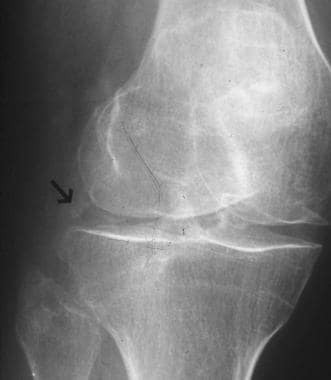 Oblique radiograph of the right knee demonstrates bright triangular lines on either side of the joint. This finding represents calcium in the triangular menisci, which represents chondrocalcinosis. 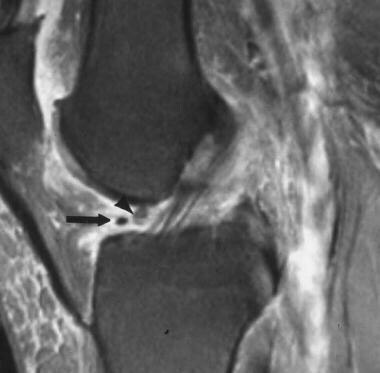 A globular calcium opacity (arrow) is above the periphery of the body of the lateral meniscus; this might represent a calcified loose body, either in the joint proper or in the popliteus recess. The presence of chondrocalcinosis can result in a false-positive diagnosis of a meniscal tear. Correlation with plain radiographic results reduces the incidence of this error. Separate portions of the posterior horn of the LM may be mistaken for a bucket handle tear on coronal images. Normal meniscal signal is present on the sagittal images. The bursa of the medial collateral ligament (MCL) is located between the periphery of the body of the MM and the MCL. Fluid within the bursa may be mistaken for a peripheral meniscocapsular tear on T2W1. Aliasing occurs when all the anatomical structures of a desired body segment are not included in the field of view of the imaging section. This can be eliminated by increasing the field of view, oversampling by applying saturation pulses outside the region, or using surface coils. Chemical-shift artifacts are found at the interface between fat and other structures. These increase with field strength and are more pronounced in images acquired with a narrow bandwidth. Motion artifacts arise from flow in pulsating blood vessels, and reduced levels of patient cooperation, which is sometimes related to pain and apprehension. Inhomogeneous fat saturation is caused by a nonuniform magnetic field. It is more pronounced on frequency-selective, T2-weighted, spin-echo images. It is also found in the presence of metallic artifacts. Repair or resection of meniscal injuries is one of the most common orthopedic operative procedures. Meniscal injuries have a tremendous physical and financial impact on the population. It has been estimated that more than 1.7 million patients undergo meniscal surgery every year. Various treatment options have been used for meniscal repair and reconstruction. The optimal treatment of meniscal lesions remains controversial. With the evolution of diagnostic MRI, it is no longer sufficient for the orthopedist to simply know that a meniscal tear is present. Treatment depends on knowledge of the exact type, location, and extent of the meniscal tear. Severe damage, loss, or removal of the menisci frequently leads to joint instability and, later, accelerated degenerative joint disease (DJD), resulting in further disability and joint replacement. Factors associated with poor clinical outcomes after partial meniscotomy include a great severity of cartilage loss and bone marrow edema in the same compartment of the meniscal tear. A greater severity of meniscal extrusion and longer meniscal tears on preoperative MRI are associated with poor clinical outcomes. Poorer clinical outcomes are also associated with meniscal root tears because these are often associated with meniscal extrusion. Horizontal and oblique tears appear to cause symptoms only when associated with collateral ligament lesions or bone marrow edema. Rubin DA, Paletta GA Jr. Current concepts and controversies in meniscal imaging. Magn Reson Imaging Clin N Am. 2000 May. 8(2):243-70. [Medline]. Bui-Mansfield LT, Youngberg RA, Warme W, Pitcher JD, Nguyen PL. Potential cost savings of MR imaging obtained before arthroscopy of the knee: evaluation of 50 consecutive patients. AJR Am J Roentgenol. 1997 Apr. 168(4):913-8. [Medline]. van Trommel MF, Simonian PT, Potter HG. Arthroscopic meniscal repair with fibrin clot of complete radial tears of the lateral meniscus in the avascular zone. Arthroscopy. 1998 May-Jun. 14(4):360-5. [Medline]. Harrison BK, Abell BE, Gibson TW. The Thessaly test for detection of meniscal tears: validation of a new physical examination technique for primary care medicine. Clin J Sport Med. 2009 Jan. 19(1):9-12. [Medline]. Nguyen JC, De Smet AA, Graf BK, Rosas HG. MR Imaging-based Diagnosis and Classification of Meniscal Tears. Radiographics. 2014 Jul-Aug. 34(4):981-99. [Medline]. Helms CA. The meniscus: recent advances in MR imaging of the knee. AJR Am J Roentgenol. 2002 Nov. 179(5):1115-22. [Medline]. Helms CA, Laorr A, Cannon WD Jr. The absent bow tie sign in bucket-handle tears of the menisci in the knee. AJR Am J Roentgenol. 1998 Jan. 170(1):57-61. [Medline]. De Smet AA, Blankenbaker DG, Kijowski R, Graf BK, Shinki K. MR diagnosis of posterior root tears of the lateral meniscus using arthroscopy as the reference standard. AJR Am J Roentgenol. 2009 Feb. 192(2):480-6. [Medline]. Voloshin AS, Wosk J. Shock absorption of meniscectomized and painful knees: a comparative in vivo study. J Biomed Eng. 1983 Apr. 5(2):157-61. [Medline]. Fairbanks RJ. The Washington conference of clergymen and psychiatrists. Ment Hyg. 1948 Apr. 32(2):289-95. [Medline]. Arnoczky SP, DiCarlo EF, O'Brien SJ, Warren RF. Cellular repopulation of deep-frozen meniscal autografts: an experimental study in the dog. Arthroscopy. 1992. 8(4):428-36. [Medline]. Johnson MJ, Lucas GL, Dusek JK. Isolated arthroscopic meniscal repair: a long-term outcome study (more than 10 years). Am J Sports Med. 1999 Jan-Feb. 27(1):44-9. [Medline]. Koski JA, Ibarra C, Rodeo SA. Meniscal injury and repair: clinical status. Orthop Clin North Am. 2000 Jul. 31(3):419-36. [Medline]. Thornton DD, Rubin DA. Magnetic resonance imaging of the knee menisci. Semin Roentgenol. 2000 Jul. 35(3):217-30. [Medline]. Fowler PJ, Lubliner JA. The predictive value of five clinical signs in the evaluation of meniscal pathology. Arthroscopy. 1989. 5(3):184-6. [Medline]. Spiers AS, Meagher T, Ostlere SJ, Wilson DJ, Dodd CA. Can MRI of the knee affect arthroscopic practice? A prospective study of 58 patients. J Bone Joint Surg Br. 1993 Jan. 75(1):49-52. [Medline]. Keene GC, Bickerstaff D, Rae PJ, Paterson RS. The natural history of meniscal tears in anterior cruciate ligament insufficiency. Am J Sports Med. 1993 Sep-Oct. 21(5):672-9. [Medline]. Rubin DA, Kettering JM, Towers JD. MR imaging of knees having isolated and combined ligament injuries. AJR Am J Roentgenol. 1998 May. 170(5):1207-13. [Medline]. Matava MJ, Eck K, Totty W, Wright RW, Shively RA. Magnetic resonance imaging as a tool to predict meniscal reparability. Am J Sports Med. 1999 Jul-Aug. 27(4):436-43. [Medline]. Steinbach LS, Palmer WE, Schweitzer ME. Special focus session. MR arthrography. Radiographics. 2002 Sep-Oct. 22(5):1223-46. [Medline]. Shankman S, Beltran J, Melamed E, Rosenberg ZS. 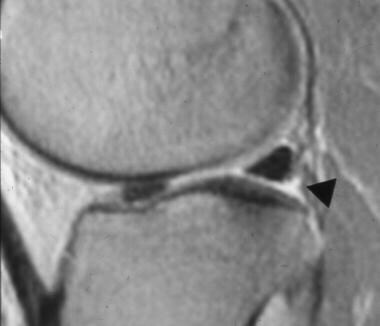 Anterior horn of the lateral meniscus: another potential pitfall in MR imaging of the knee. Radiology. 1997 Jul. 204(1):181-4. [Medline]. De Smet AA, Asinger DA, Johnson RL. Abnormal superior popliteomeniscal fascicle and posterior pericapsular edema: indirect MR imaging signs of a lateral meniscal tear. AJR Am J Roentgenol. 2001 Jan. 176(1):63-6. [Medline]. Crues JV 3rd, Mink J, Levy TL, Lotysch M, Stoller DW. Meniscal tears of the knee: accuracy of MR imaging. Radiology. 1987 Aug. 164(2):445-8. [Medline]. Singh K, Helms CA, Jacobs MT, Higgins LD. MRI appearance of Wrisberg variant of discoid lateral meniscus. AJR Am J Roentgenol. 2006 Aug. 187(2):384-7. [Medline]. Stoller DW, Martin C, Crues JV 3rd, Kaplan L, Mink JH. Meniscal tears: pathologic correlation with MR imaging. Radiology. 1987 Jun. 163(3):731-5. [Medline]. Yue BW, Gupta AK, Moorman CT 3rd, Garrett WE, Helms CA. 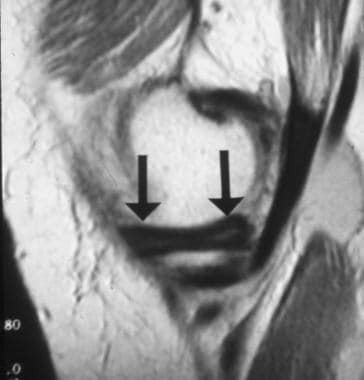 Wrisberg variant of the discoid lateral meniscus with flipped meniscal fragments simulating bucket-handle tear: MRI and arthroscopic correlation. Skeletal Radiol. 2011 Aug. 40(8):1089-94. [Medline]. Boxheimer L, Lutz AM, Zanetti M, Treiber K, Labler L, Marincek B, et al. Characteristics of displaceable and nondisplaceable meniscal tears at kinematic MR imaging of the knee. Radiology. 2006 Jan. 238(1):221-31. [Medline]. Crues JV, Stoller DW. The Menisci. Mink JH, Reicher MA, Crues JV, et al. MRI of the Knee. 2nd ed. New York, NY: Raven; 1993. 91-140. Bikkina RS, Tujo CA, Schraner AB, Major NM. The "floating" meniscus: MRI in knee trauma and implications for surgery. AJR Am J Roentgenol. 2005 Jan. 184(1):200-4. [Medline]. Cotten A, Delfaut E, Demondion X. MR imaging of the knee at 0.2 and 1.5 T: correlation with surgery. AJR Am J Roentgenol. 2000 Apr. 174(4):1093-7. [Medline]. De Smet AA, Graf BK. Meniscal tears missed on MR imaging: relationship to meniscal tear patterns and anterior cruciate ligament tears. AJR Am J Roentgenol. 1994 Apr. 162(4):905-11. [Medline]. Stanitski CL. Correlation of arthroscopic and clinical examinations with magnetic resonance imaging findings of injured knees in children and adolescents. Am J Sports Med. 1998 Jan-Feb. 26(1):2-6. [Medline]. Trattnig S, Rand T, Czerny C, Stocker R, Breitenseher M, Kainberger F, et al. Magnetic resonance imaging of the postoperative knee. Top Magn Reson Imaging. 1999 Aug. 10(4):221-36. [Medline]. Burke BJ, Escobedo EM, Wilson AJ. Chondrocalcinosis mimicking a meniscal tear on MR imaging. AJR Am J Roentgenol. 1998 Jan. 170(1):69-70. [Medline]. Lim PS, Schweitzer ME, Bhatia M. Repeat tear of postoperative meniscus: potential MR imaging signs. Radiology. 1999 Jan. 210(1):183-8. [Medline]. Magee T, Shapiro M, Williams D. Prevalence of meniscal radial tears of the knee revealed by MRI after surgery. AJR Am J Roentgenol. 2004 Apr. 182(4):931-6. [Medline]. Muellner T, Egkher A, Nikolic A. Open meniscal repair: clinical and magnetic resonance imaging findings after twelve years. Am J Sports Med. 1999 Jan-Feb. 27(1):16-20. [Medline]. Munk B, Madsen F, Lundorf E. Clinical magnetic resonance imaging and arthroscopic findings in knees: a comparative prospective study of meniscus anterior cruciate ligament and cartilage lesions. Arthroscopy. 1998 Mar. 14(2):171-5. [Medline]. Ruff C, Weingardt JP, Russ PD. MR imaging patterns of displaced meniscus injuries of the knee. AJR Am J Roentgenol. 1998 Jan. 170(1):63-7. [Medline]. Ryu KN, Kim IS, Kim EJ. MR imaging of tears of discoid lateral menisci. AJR Am J Roentgenol. 1998 Oct. 171(4):963-7. [Medline]. Subhas N, Kao A, Freire M, Polster JM, Obuchowski NA, Winalski CS. MRI of the Knee Ligaments and Menisci: Comparison of Isotropic-Resolution 3D and Conventional 2D Fast Spin-Echo Sequences at 3 T. AJR Am J Roentgenol. 2011 Aug. 197(2):442-50. [Medline]. Antonio GE, Griffith JF, Yeung DK. Small-field-of-view MRI of the knee and ankle. AJR Am J Roentgenol. 2004 Jul. 183(1):24-8. [Medline]. Carrino JA, Schweitzer ME. Imaging of sports-related knee injuries. Radiol Clin North Am. 2002 Mar. 40(2):181-202. [Medline]. Wolff AB, Pesce LL, Wu JS, Smart LR, Medvecky MJ, Haims AH. Comparison of spin echo T1-weighted sequences versus fast spin-echo proton density-weighted sequences for evaluation of meniscal tears at 1.5 T. Skeletal Radiol. 2009 Jan. 38(1):21-9. [Medline]. Blackman GB, Major NM, Helms CA. Comparison of Fast Spin-Echo Verses Conventional Spin-Echo MRI For Evaluating Meniscal Tears. Am J Roentgenol. 2005. 184:1740-1743. Kowalchuk RM, Kneeland JB, Dalinka MK. MRI of the knee: value of short echo time fast spin-echo using high performance gradients versus conventional spin-echo imaging for the detection of meniscal tears. Skeletal Radiol. 2000 Sep. 29(9):520-4. [Medline]. Cothian RL, Major N, Holmes C, et al. MRI imaging of meniscal contusions of the knee. AJR Am J Roentgenol. November 2001. 177:1189-92. McCauley TR, Jee WH, Galloway MT. Grade 2C signal in the meniscus [correction of mensicus] on MR imaging of the knee. AJR Am J Roentgenol. 2002 Sep. 179(3):645-8. [Medline]. Laundre BJ, Collins MS, Bond JR, Dahm DL, Stuart MJ, Mandrekar JN. MRI accuracy for tears of the posterior horn of the lateral meniscus in patients with acute anterior cruciate ligament injury and the clinical relevance of missed tears. AJR Am J Roentgenol. 2009 Aug. 193(2):515-23. [Medline]. De Smet AA, Tuite MJ. Use of the "two-slice-touch" rule for the MRI diagnosis of meniscal tears. AJR Am J Roentgenol. 2006 Oct. 187(4):911-4. [Medline]. Baxamusa TH, Galloway MT. Irreducible knee dislocations secondary to interposed menisci. Am J Orthop. 2001 Feb. 30(2):141-3. [Medline]. Turkmen F, Korucu IH, Sever C, Demirayak M, Goncu G, Toker S. Free medial meniscal fragment which mimics the dislocated bucket-handle tear on MRI. Case Rep Orthop. 2014. 2014:647491. [Medline]. [Full Text]. Johnson RL, De Smet AA. MR visualization of the popliteomeniscal fascicles. Skeletal Radiol. 1999 Oct. 28(10):561-6. [Medline]. Lecas LK, Helms CA, Kosarek FJ. Inferiorly displaced flap tears of the medial meniscus: MR appearance and clinical significance. AJR Am J Roentgenol. 2000 Jan. 174(1):161-4. [Medline]. Dunoski B, Zbojniewicz AM, Laor T. MRI of displaced meniscal fragments. Pediatr Radiol. 2011 Aug 24. [Medline]. Chen HC, Hsu CY, Shih TT. MR imaging of displaced meniscal tears of the knee. Importance of a "disproportional posterior horn sign". Acta Radiol. 2001 Jul. 42(4):417-21. [Medline]. Blankenbaker DG, De Smet AA, Smith JD. Usefulness of two indirect MR imaging signs to diagnose lateral meniscal tears. AJR Am J Roentgenol. 2002 Mar. 178(3):579-82. [Medline]. De Maeseneer M, Lenchik L, Starok M. Normal and abnormal medial meniscocapsular structures: MR imaging and sonography in cadavers. AJR Am J Roentgenol. 1998 Oct. 171(4):969-76. [Medline]. Campbell SE, Sanders TG, Morrison WB. MR imaging of meniscal cysts: incidence, location, and clinical significance. AJR Am J Roentgenol. 2001 Aug. 177(2):409-13. [Medline]. De Smet AA, Graf BK, del Rio AM. Association of parameniscal cysts with underlying meniscal tears as identified on MRI and arthroscopy. AJR Am J Roentgenol. 2011 Feb. 196(2):W180-6. [Medline]. Pfirrmann CW, Zanetti M, Hodler J. Joint magnetic resonance imaging: normal variants and pitfalls related to sports injury. Radiol Clin North Am. 2002 Mar. 40(2):167-80. [Medline]. De Smet AA. How I diagnose meniscal tears on knee MRI. AJR Am J Roentgenol. 2012 Sep. 199(3):481-99. [Medline]. Rennie WJ, Finlay DB. 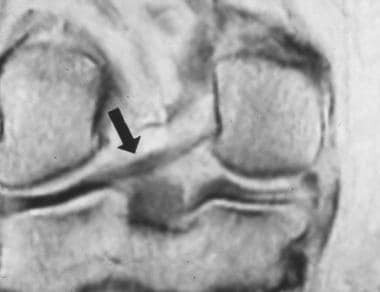 Meniscal extrusion in young athletes: associated knee joint abnormalities. AJR Am J Roentgenol. 2006 Mar. 186(3):791-4. [Medline]. Bergin D, Hochberg H, Zoga AC, Qazi N, Parker L, Morrison WB. Indirect soft-tissue and osseous signs on knee MRI of surgically proven meniscal tears. AJR Am J Roentgenol. 2008 Jul. 191(1):86-92. [Medline]. Justice WW, Quinn SF. Error patterns in the MR imaging evaluation of menisci of the knee. Radiology. 1995 Sep. 196(3):617-21. [Medline]. De Smet AA, Tuite MJ, Norris MA, Swan JS. MR diagnosis of meniscal tears: analysis of causes of errors. AJR Am J Roentgenol. 1994 Dec. 163(6):1419-23. [Medline]. Chen HN, Dong QR, Wang Y. Accuracy of low-field MRI on meniscal tears. Genet Mol Res. 2014 Jun 9. 13(2):4267-71. [Medline]. Major NM, Beard LN Jr, Helms CA. Accuracy of MR imaging of the knee in adolescents. AJR Am J Roentgenol. 2003 Jan. 180(1):17-9. [Medline]. Phelan N, Rowland P, Galvin R, O'Byrne JM. A systematic review and meta-analysis of the diagnostic accuracy of MRI for suspected ACL and meniscal tears of the knee. Knee Surg Sports Traumatol Arthrosc. 2015 Nov 27. [Medline]. De Smet AA, Mukherjee R. Clinical, MRI, and arthroscopic findings associated with failure to diagnose a lateral meniscal tear on knee MRI. AJR Am J Roentgenol. 2008 Jan. 190(1):22-6. [Medline]. De Smet AA, Nathan DH, Graf BK, Haaland BA, Fine JP. Clinical and MRI findings associated with false-positive knee MR diagnoses of medial meniscal tears. AJR Am J Roentgenol. 2008 Jul. 191(1):93-9. [Medline]. Ahn JH, Jeong SH, Kang HW. Risk Factors of False-Negative Magnetic Resonance Imaging Diagnosis for Meniscal Tear Associated With Anterior Cruciate Ligament Tear. Arthroscopy. 2016 Feb 25. [Medline]. Chambers S, Cooney A, Caplan N, Dowen D, Kader D. The accuracy of magnetic resonance imaging (MRI) in detecting meniscal pathology. J R Nav Med Serv. 2014. 100 (2):157-60. [Medline]. Applegate GR, Flannigan BD, Tolin BS, Fox JM, Del Pizzo W. MR diagnosis of recurrent tears in the knee: value of intraarticular contrast material. AJR Am J Roentgenol. 1993 Oct. 161(4):821-5. [Medline]. Kaushik S, Erickson JK, Palmer WE, Winalski CS, Kilpatrick SJ, Weissman BN. Effect of chondrocalcinosis on the MR imaging of knee menisci. AJR Am J Roentgenol. 2001 Oct. 177(4):905-9. [Medline]. Vande Berg BC, Malghem J, Poilvache P, Maldague B, Lecouvet FE. Meniscal tears with fragments displaced in notch and recesses of knee: MR imaging with arthroscopic comparison. Radiology. 2005 Mar. 234(3):842-50. [Medline]. Watt AJ, Halliday T, Raby N. The value of the absent bow tie sign in MRI of bucket-handle tears. Clin Radiol. 2000 Aug. 55(8):622-6. [Medline]. Otani T, Matsumoto H, Suda Y. Proper use of MR imaging in internal derangement of the knee (orthopedic surgeon''s view). Semin Musculoskelet Radiol. 2001 Jun. 5(2):143-5. [Medline]. Peh WC, Chan JH, Shek TW. The effect of using shorter echo times in MR imaging of knee menisci: a study using a porcine model. AJR Am J Roentgenol. 1999 Feb. 172(2):485-8. [Medline]. Bhatia S, Laprade CM, Ellman MB, Laprade RF. Meniscal Root Tears: Significance, Diagnosis, and Treatment. Am J Sports Med. 2014 Mar 12. [Medline]. Hauger O, Frank LR, Boutin RD. Characterization of the "red zone" of knee meniscus: MR imaging and histologic correlation. Radiology. 2000 Oct. 217(1):193-200. [Medline]. Huetink K, Nelissen RG, Watt I, van Erkel AR, Bloem JL. Localized development of knee osteoarthritis can be predicted from MR imaging findings a decade earlier. Radiology. 2010 Aug. 256(2):536-46. [Medline]. Zanetti M, Pfirrmann CW, Schmid MR, Romero J, Seifert B, Hodler J. Clinical course of knees with asymptomatic meniscal abnormalities: findings at 2-year follow-up after MR imaging-based diagnosis. Radiology. 2005 Dec. 237(3):993-7. [Medline]. Newman AP, Daniels AU, Burks RT. Principles and decision making in meniscal surgery. Arthroscopy. 1993. 9(1):33-51. [Medline]. 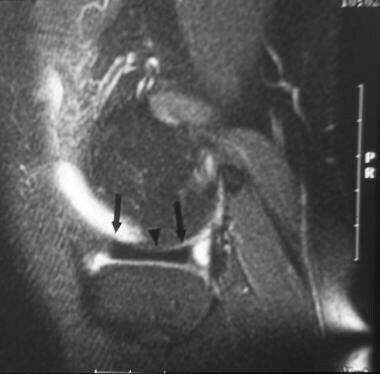 Axial fat-saturated proton density–weighted image demonstrates the transverse (intermeniscal) ligament (arrows) connecting the anterior portions of the medial and lateral menisci. Coronal proton density–weighted image shows the intermeniscal ligament (arrow) connecting the anterior horns of the medial and lateral menisci. Sagittal proton density–weighted image of the lateral knee compartment. It shows the superior fascicle (arrow) attaching the posterior horn of the lateral meniscus with the joint capsule. Hyperintense (bright) fluid is present in the popliteus recess. The inferior fascicle is not yet visualized. Coronal proton density–weighted image posterior to the knee joint shows the normal junction of the popliteus tendon and muscle passing obliquely downwards to insert on the posterior tibial metaphysis. There is a tear to the conjoint tendon of the biceps muscle and lateral collateral ligament (LCL, arrow). Coronal proton density–weighted image of the popliteus tendon (outer arrows), which passes obliquely caudal, left to right, becoming the popliteus muscle (lower central arrow) and inserting on the proximal posterior metaphysis. 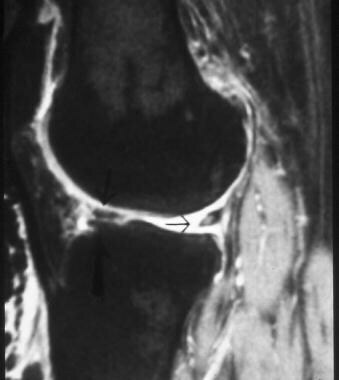 Coronal fat-saturated proton density–weighted image of the anterior knee shows the horizontal attachment of the anterior horn of the lateral meniscus (arrow) attaching near the intercondylar eminence. Coronal fat-saturated proton density–weighted image shows the attachment of the anterior horn of the lateral meniscus. In this patient, the anterior horn attachment is near the tibial attachment of the anterior cruciate ligament (ACL, arrow). Sagittal proton density–weighted image of the medial compartment. The thin apex of the meniscal body connects the large anterior and posterior horns at this level, giving the appearance of a bow-tie configuration (arrow). Sagittal proton density–weighted shows a small amount of abnormal signal intensity in the anterior horn of the medial meniscus (arrow). This represents a grade 1 change in signal intensity. Coronal fat-saturated proton density–weighted image of the knee shows a bucket tear of the posterior horn of the medial meniscus. It is a full-thickness tear involving both the superior and inferior articular surfaces. The wide separation of the margins of the tear usually results in poor outcomes with surgical repair. Also present is a horizontal tear of the meniscal body extending from the margin of the bucket handle tear to the meniscal base. Such tears usually occur in older patients and are not usually amenable to surgical repair. Coronal fat-saturated proton density–weighted image of the knee shows a full-thickness radial tear. The ability of fat saturation to remove the high signal intensity of fat from the signal intensity bone marrow and subcutaneous tissue makes it an excellent way to highlight meniscal tears. Sagittal proton density–weighted image shows an amputated inferior base of the posterior horn of the lateral meniscus; this represents a partial tear. Sagittal proton density–weighted image shows almost complete disappearance of the posterior horn of the medial meniscus. The loss of the normal shock-absorbing function of the meniscus predisposes the person to the loss of cartilage and subsequent bone abnormalities typical of degenerative arthritis. Sagittal fat-saturated proton density–weighted image shows amputation of the apex of the posterior horn of the lateral meniscus. The anterior horn is deformed, and the image shows irregularity and deformity of the adjacent portion of the femur, which may have occurred with the injury to the anterior horn. Sagittal proton density–weighted image shows an enlarged, abnormal, globular posterior horn of the medial meniscus with abnormal signal intensity. The abnormal appearance is related to edema from the meniscal tear. 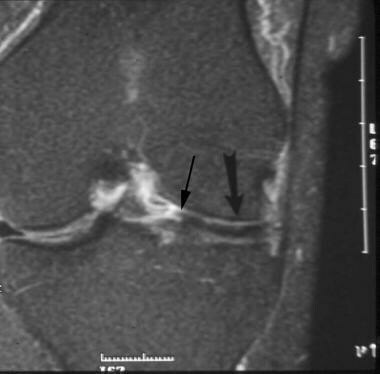 Image shows a uniform decrease in the size of the body of the medial meniscus (arrow). The superior apex of the body of the lateral meniscus (arrowhead) has been amputated. Image shows amputation of much of the inferior portion of the apex and part of the base of the body of the medial meniscus. Coronal proton density–weighted image shows that most of the posterior horn of the lateral meniscus has been amputated (vertical arrow). An extensive partial-thickness tear is present on the undersurface of the body of the medial meniscus and extends to the meniscal base (oblique arrow). Sagittal fat-saturated proton density-weighted image of the medial compartment showing a large area of increased signal intensity (arrow) representing joint fluid which, occupies the site where the normal meniscus should be located. This cleft within the meniscus represents a large, full-thickness radial tear of the meniscal body. It is full thickness because the tear involves the superior and inferior articular surfaces of the meniscus. The radial tear divides the meniscal body into anterior and posterior portions. Sagittal fat-saturated proton density–weighted image, slightly more medial in the knee joint. 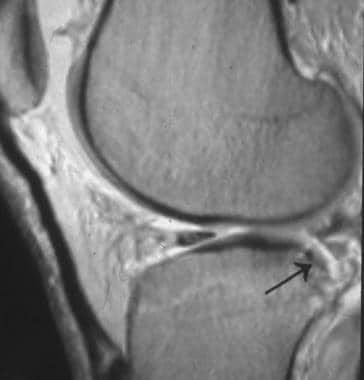 Image shows the horizontal tear in the posterior horn of the medial meniscus (arrow). The amputation of the apex of the inferior horn is more evident on this image than on the other one. When a meniscal tear is visualized on at least 2 consecutive images, the accuracy that the tear is real and not an artifact approaches 100%. Its presence is almost always verified on arthroscopy. Sagittal fat-saturated proton density–weighted image shows the tibial insertion of the posterior horn of the medial meniscus (MM). This portion of the meniscus has a normal, speckled appearance. 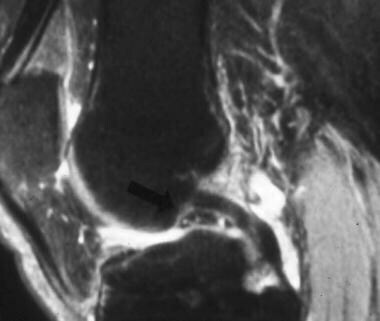 Coronal fat-saturated proton density–weighted image shows the tibial insertion of the anterior horn of the lateral meniscus (LM, arrows) and the intimate association sometimes seen between the insertion of the meniscus and the tibial insertion of the anterior cruciate ligament (ACL). Normal interdigitations of the ACL are present at this site. Fat is also present and appears hyperintense on T1- and proton density–weighted images. This is not to be confused with a meniscal or ACL tear. Sagittal proton density–weighted image shows a full-thickness horizontal tear of the posterior horn of the lateral meniscus (LM, arrow) involving the superior articular surface. Coronal fat-saturated proton density-weighted image of the same patient as in the previous image shows a different view of the meniscal fragment and the anterior horn. As in the previous image, an appearance of a double anterior meniscus is shown. Coronal fat-saturated proton density–weighted image of the posterior knee Shows an extensive horizontal tear involving the undersurface of the posterior meniscus. Also present is a flap on the undersurface of the meniscus that has been displaced medially and that is now directed vertically and inferiorly. Note the normal insertion site of the semimembranosus tendon (arrow) that might be confused for a displaced meniscal fragment. Anterior image of the same patient as in the previous image shows the tear to the undersurface of the posterior horn of the medial meniscus (MM, large solid arrow). 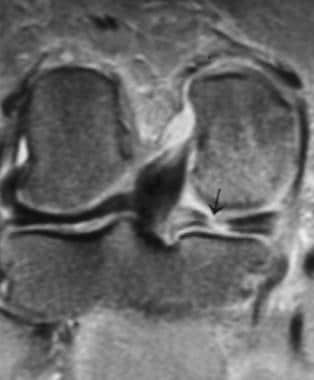 Image also shows a displaced meniscal fragment lying on top of the body of the lateral meniscus (LM, small solid arrow). The lateral meniscal tear was located more anterior in the body (picture not shown). 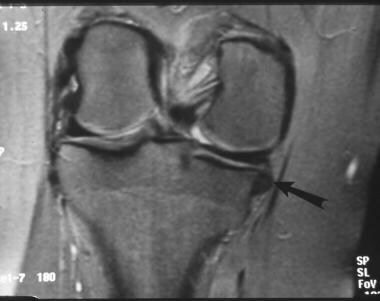 Open arrow indicates abnormal signal at the origin of the popliteus tendon, representing a partial tear. Sagittal fat-saturated proton density–weighted image shows an unusually tall anterior meniscal horn. On closer inspection, a separation is present between the upper (arrowhead) and lower (arrow) portions. The upper portion is a displaced meniscal fragment from the posterior meniscus lying on top of the anterior horn. Most of the posterior meniscus is absent from its usual location. When the height of a meniscus is greater than 8 mm, it likely represents the combination of a displaced meniscal fragment and a normal meniscus. Axial fat-saturated proton density–weighted image shows the location of the cyst in the most medial portion of the medial meniscus. Sagittal fat-saturated proton density–weighted image shows the cyst (arrow) in a different projection. Coronal fat-saturated proton density–weighted image obtained more posteriorly. Abnormal signal intensity (small arrows) is present medial to the base of the posterior horn of the medial meniscus (MM). No medial collateral ligament (MCL) is discernible at this level; this appearance indicates a tear. This is fluid of the meniscus from its normal attachment with the MCL, representing meniscocapsular separation. The insertion of the semimembranosus tendon (large arrow) has abnormal signal intensity; this finding indicates a tear. Coronal fat-saturated proton density-weighted image obtained more posteriorly than in the previous image. 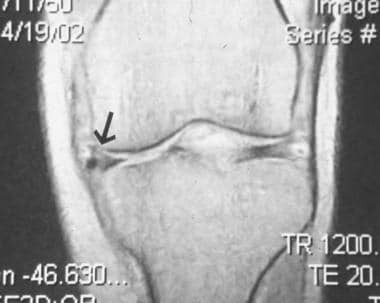 The separation of the base of the meniscus from the medial collateral ligament (MCL, large solid arrow) is evident. Image shows interruption and abnormal signal intensity in the MCL (small arrows), indicating a tear. Large open arrow indicates a soft tissue density, either blood products or a free meniscal fragment below the joint space between the tibia and MCL. It is easy to see how inferomedial displaced tears from the medial meniscus (MM) can go unnoticed on arthroscopy. The tear is hidden,, and it is difficult to bend the arthroscope around the tibia to see below the joint. A fracture is present in the central portion of the articular surface of the tibia (oblique central arrow in the tibia),, and another tear is present in the posterior medial horn of the medial meniscus near the tibial insertion site. Image in a different patient shows a cyst in the body of the medial meniscus (MM) with meniscocapsular separation. At this level, the medial collateral ligament (MCL, arrow) is intact. Sagittal proton density–weighted image obtained from the outer portion of the lateral aspect of the knee. Image shows interruption of the inferior fascicle (arrow) of the lateral meniscus (LM). No pericapsular edema is present. Sagittal proton density–weighted image of the same patient as in the previous image but slightly more medial. Image shows abnormal signal intensity with interruption of the superior fascicle of the lateral meniscus (LM). No pericapsular edema is present. 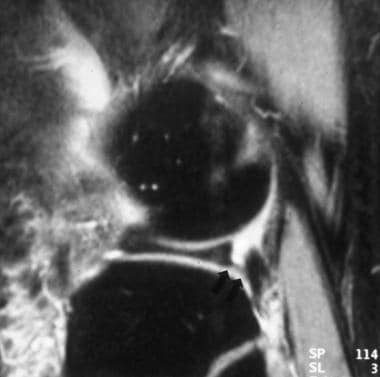 Sagittal proton density–weighted image of a patient who underwent partial meniscectomy of the body and posterior horn of the medial meniscus (MM). Image shows slight hypertrophy and increased signal intensity to the posterior femur, indicating secondary degenerative arthritis related to removal of the meniscus. Coronal fat-saturated proton density–weighted image of the posterior aspect of the knee. A soft tissue density (arrow) lies between the lateral portion of the medial femoral epicondyle and the posterior cruciate ligament (PCL). This represents the notch fragment. A horizontal tear is present on undersurface of the body of the medial meniscus (MM). The difference between the notch fragment sign and the double PCL sign is merely one of position of the meniscal fragment. The fragment is more medial with the notch fragment sign than in the double PCL sign. Coronal fat-saturated proton density–weighted image of the posterior aspect of the knee shows the normal vertically oblique course of the popliteus recess. Immediately medial to the recess is a longitudinally oblique area of high signal intensity (arrow) located in the posterior horn of the lateral meniscus (LM), communicating with the recess and representing an oblique tear. 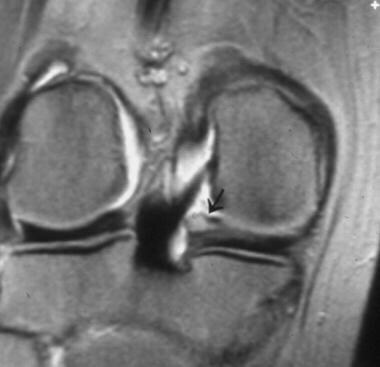 Coronal proton density–weighted image shows a displaced medial meniscal body (arrow) bowing the medial collateral ligament (MCL). The thin meniscus apex is pointing upward, and the thicker base is more caudal in position, indicating meniscocapsular separation with reorientation of the position of the meniscus. In addition, the meniscus has twisted 180° because the concave femoral surface is directed toward the femur. If it had simply flipped upward, it would face the MCL.